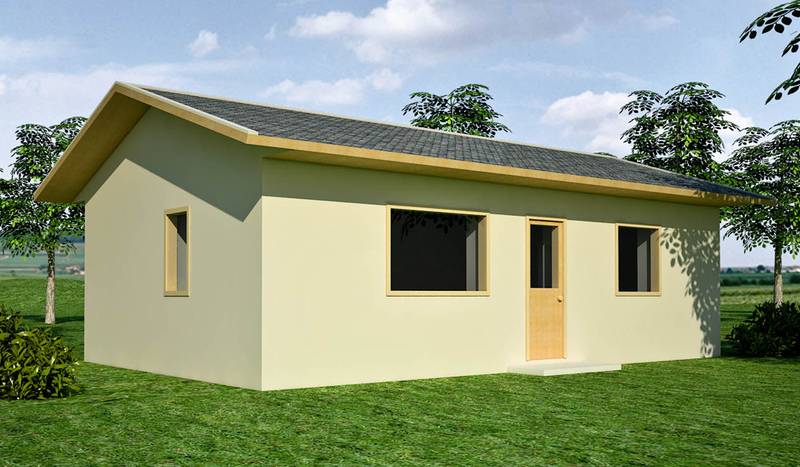 Description: This plan is designed to be compact and efficient. Most houses this size do not have as many features — washer/dryer, wood stove, and modern kitchen and bath. There are even two closets. An archway separates the bedroom from the main living area, yet maintains a sense of privacy with a room divider. Note: this plan is listed in the free shelter category. Do you know if you could potentially use a rocket mass heater in the earthbag dwellings? Some food for thought: You could put the bathroom where the hallway is and extend the kitchen down to the back wall and then line up the plumbing on the same wall. 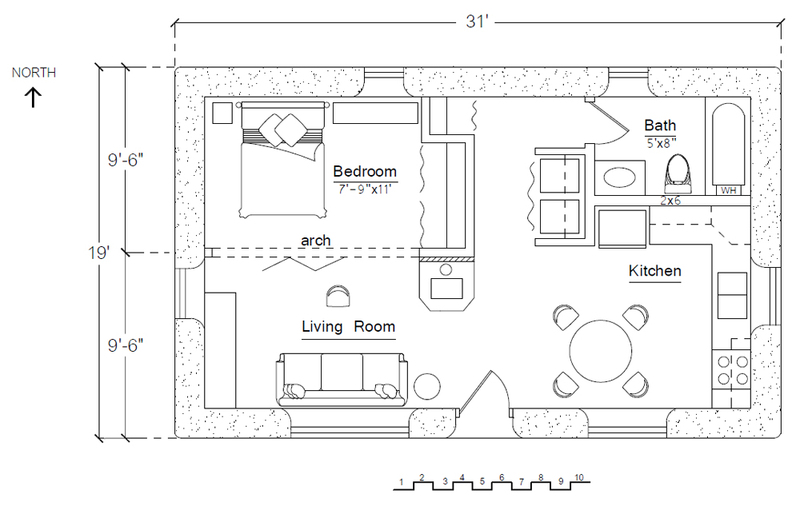 Nice design, but in that space you could have 2 bedrooms. My 20×20 house has 2, with doors, and a bathroom with shower only. That hallway to your bathroom takes up a lot of space. I do like that kitchen layout tho. I really dig this ! But I’d need 2 bedrooms and a work shop. I was thinking of putting 2 economizers side by side (sharing the North wall), so the first economizer would be as it is and the second has the left half for another bedroom and the right half for a workshop. The I’d put a flat roof across them, but not completely flat, at an angle to catch rain water. What angle do you think would be good for that roof ? The minimum roof angle depends on your climate and what roofing materials you use. Check out local roof construction. Ok thanks, I am thinking 2 inches of height per foot on the roof pitch. Do you have an approximate cost on this particular project? Just a general idea really is all I am requesting because I know a lot will depend on local supply costs and sub contracting costs. Am a single sr female or I’d do it all myself but alas..those days are no longer….It appears to be a great house. The only way to know is to do a cost estimate. There are too many variables. Get a book on cost estimating from the library and focus on the main expenses. That’s a pretty good design. One minor detail is you might want to rotate the sofa so it faces the mass heater. ‘Flat roofs’ are typically sloped to the back of the house where it’s out of sight. One of these days I’ll build one of your designs, or my name is mud ! Consider putting a greenhouse on front for year-round food production. You could use storm door replacement glass set between studs which rest on an earthbag foundation. Consider posting your plans on a free site like Google Docs. Total time from signup to posting your first plan takes less than 30 minutes. I like this plan because it looks “normal” and would fit into just about any neighborhood. owen, you seriously rock. I appreciate the thought and time you put into these works. I hope that you are ever blessed and continue to thrive. Good work sir! Would this plan work in a cold, wet climate (New England), since it has a roof? Certainly. It’s just a basic rancher. I would add 2″ of foam board on the exterior. In most situations I don’t recommend going below grade due to the increased risk of moisture problems. It’s all too easy to get flooded out. It’s easier and less expensive to build above grade and add some earth berming. Two feet of berming should suffice. Fill dirt for filling earthbags is cheap. Dump the piles around the jobsite to minimize labor. If the money ever became available, I’d be interested in building an underground shelter for disaster preparedness on the property. Do you disagree that Rio Rancho is nearly ideal for underground buildings ? Look at 100 year maximums before deciding. And even then you’d want to take all prudent precautions. Cloud bursts/monsoon rains can easily flood underground homes. It happens all the time. That’s why I’m wary. What could be worse than a guy with no money and a lot of questions ? Money is not very important (once you have the basic necessities of life). Teaching others and spreading the word is very important. That’s the only way we can change the world. This is such a snug design! Houses that are compact, and use space in a clever way like this one, I just find so beautiful. In summary, you have to make a cost estimate based on costs in your area. Exterior walls can be earthbags, straw bales, adobe, etc. — whatever is available and makes sense in your area. Interior walls could be wood framed, recycled wood, pallets, bamboo, etc. if you live in an area without building codes. Check your code situation before proceeding. i am very interested in building a earthbag house in Carroll county in central Ms. what i want to know is can dog food sacks be used as earthbags. i buy 20 lb upto 50lbs . 3 times a month. thought. I could save money if could. use them. Probably not. Most dog food bags are quite weak. The bags have to withstand quite a bit of pounding. Make a sample bag and see what happens. 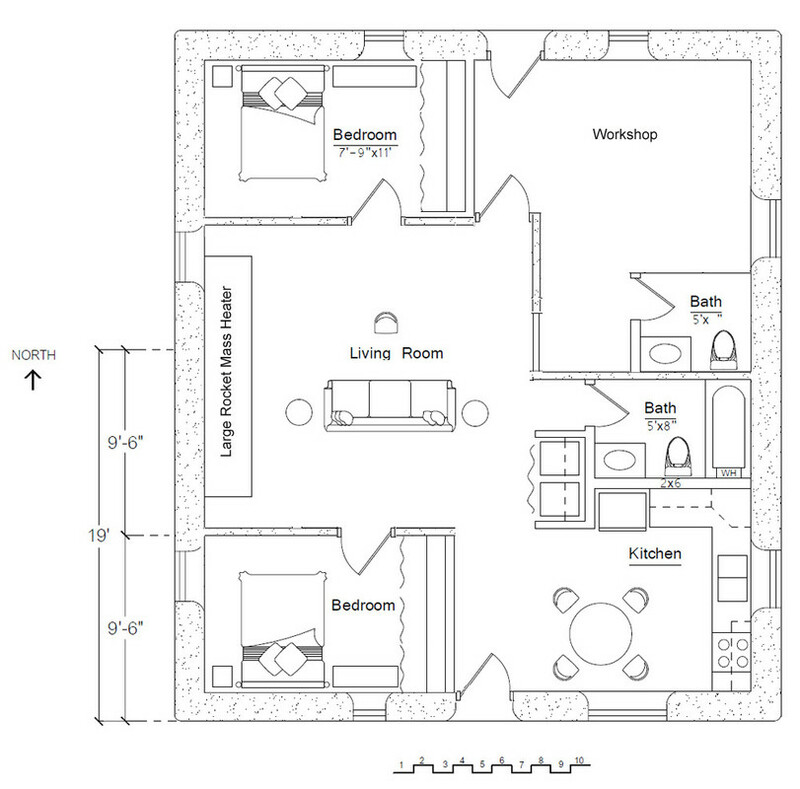 This plan would “almost” work for our very narrow 45′ lot. The front door would have to move to a narrow end. Since I am not far from Klamath Falls, I will probably have the engineers there complete plans and sign them for me, since Merced County in CA requires “engineered plans” for construction there. They are very open minded in that county about alternate building types. And I did like the comment about moving the bath wall around so that the kitchen plumbing backs up to the bath. Better would be to make it two stories, but there is concern because the lot sits on a “normally” extremely high water table (septic tanks float out) which is clay. Do not know if the soil would support the taller building and weight. There are not many floor plans with the narrow side facing the street, I think this could be nicely modified to be suitable. It sounds like the plan could be tweaked to meet your needs. You’ll need a soils test to make sure the ground can support heavy loads. I want to use straw to build my earth home…do I use full sized straw bales or break them down into smaller sections? Thank you, I’ll check it out.